A Heat Recover Ventilator (HRV) is integrated into the duct-work in a home, usually located near the furnace. The HRV expels stale indoor air to the outside and draws in fresh air from outside to be distributed throughout the home. In De-humidification mode during winter, it rapidly exchanged humid air from inside the home with dry air from outdoors while transferring the heat from the exhausted air to the incoming air through a core. 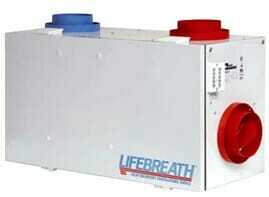 Lifebreath has the only patented aluminum core, others use a plastic or PVC corrugated type core. 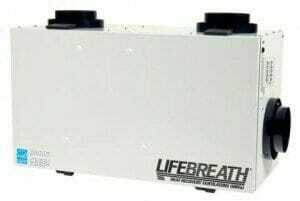 In my 25 years in the industry, I have installed and services many brands of HRV’s and Lifebreath far exceeds the others in quality, design, and easy to use controls. MAX Series HRV’s are the only five-speed ventilation units available. The MAX Series is most popular with consumers and builders alike for both new and retrofit construction. RNC Series HRV’s are our clients top pick and offer the same technology and warranty as MAX, but with simple two-speed operation. A low ventilation intermittent speed and a high speed for fast DE-humidification. All RNC products are backed by the same warranty as MAX series, including lifetime coverage on the patented aluminum core. or fill out the request info form on the contact page.